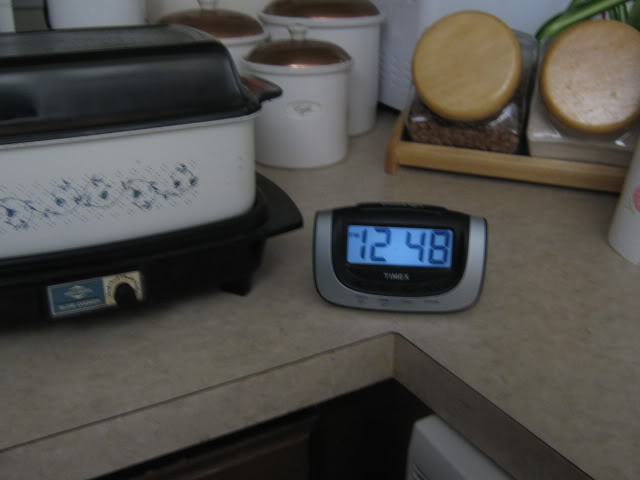 I STARTED WITH MY TRUSTY CROCK POT, ITS OLD, BUT IT IS A GREAT ONE, IT HAS 5 HEAT SETTINGS, BUT FOR THIS MEAL i STUCK IT ON THE MEDIUM ONE. 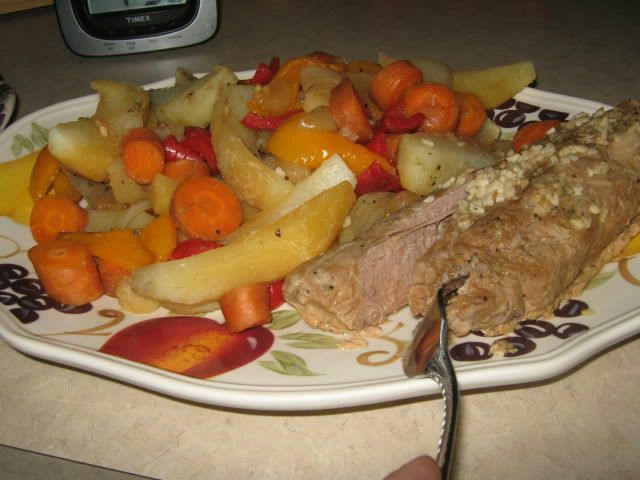 THIS IS A PORK TENDERLOIN ROAST...EXCELLENT CUT OF MEAT, NO FAT, REAL TENDER, YOU CAN'T GO WRONG WITH THIS ONE!! IT WAS STILL ABOUT HALF FROZEN WHEN I STUCK IT IN...NOT TO WORRY, THE CROCK POT WILL DO THE TRICK! AND VOILA!! AS YOU CAN SEE THIS MEAT IS TENDER ENOUGH TO CUT WITH A FORK!!! 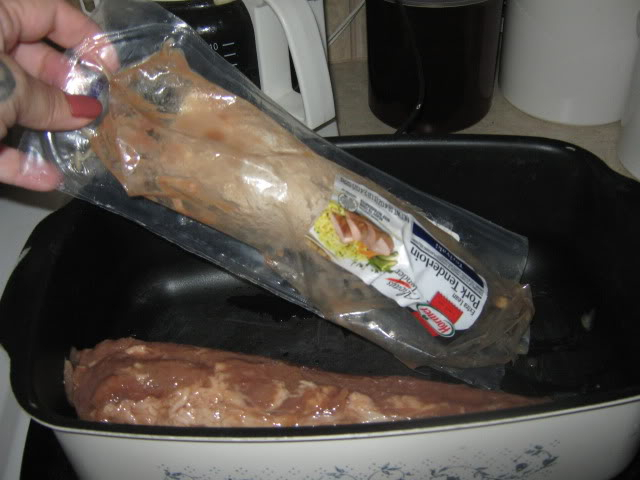 first, that pork did too have tons of fat on it!!!!!!! but looks yummy in the end!!!! i need those step by steps and i see the nice tray in the pic too!!!! NOPE...NO FAT, NOT EVEN ONE IOTA, WHAT YOU ARE SEEING IS THE MARINADE JUICES IN THE BAG....EVEN THE JUICE, AFTER IT COOKED HAD NO GREASE ON IT...NONE! 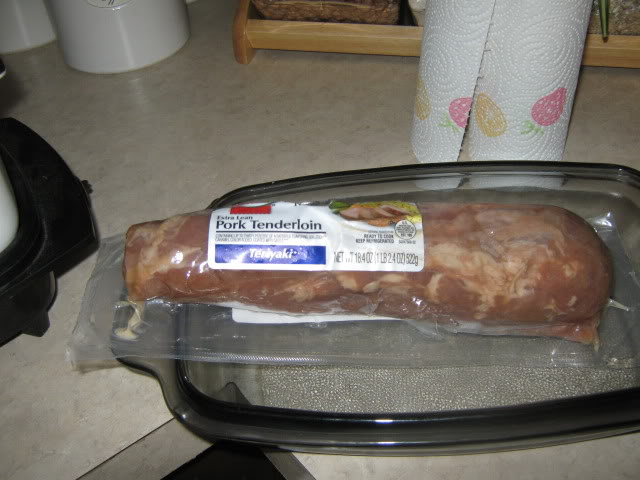 BUT THAT IS ONLY TRUE WITH A TENDERLOIN....I THINK ALL OTHER PORK WILL HAVE FAT ON IT! either way though it makes me want to fly you over and cook for me! 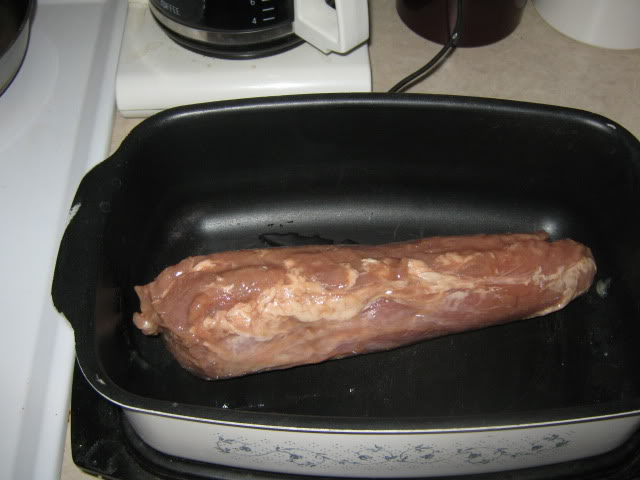 no i am serious, pork tenderloin has no fat on it. This particular brand is marinaded, and I think that is what is showing up on the picture, cuz there is no fat on it before or after cooking. 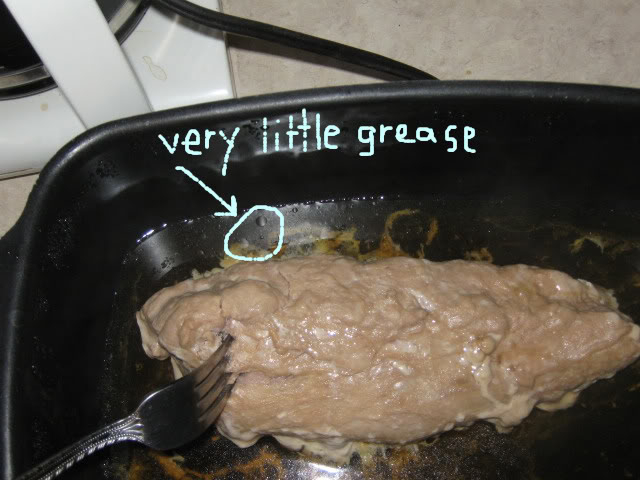 But the marinade is kind of colored funny. Or possibly the meat has coloration issues. But as far as fat goes, this is the piece for a diet conscious person. let me change that, just so I don't get 10,000 angry posts, the fat on a tenderloin is MINIMAL!!!! less fat than skinless chicken breast!! Thanks Deedee!!! Now can you do it with a pot roast. ... you sold me! i get the boneless, skinless chkn breasts and still cut like 1/4 off.... bf says i waste! ok, so the pictured one is already seasoned..... yummy! how much did it cost for that chunk? i can't remember, when Ldl511 comes on here, she'll be able to tell ya, she's good at remembering price of things. I will tell you it's NOT a cheap piece of meat. But Hormell has the $1.00 off coupons in the magazines ALL THE TIME! oh great! and do you know about how much for a pot roast? Now you are supposed to ask "What's a henweigh?" and then I say...."about 4 or 5 pounds!" 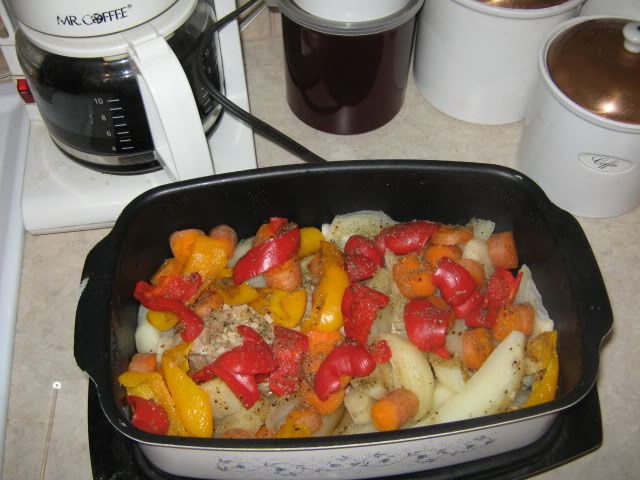 pot roasts are cheaper, anywhere from $2-$4 a pound. 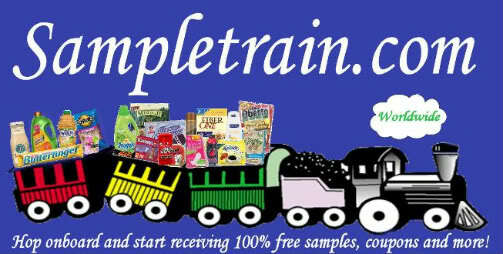 Patty432 wrote: Thanks Deedee!!! Now can you do it with a pot roast. same thing, except for the fact that that tenderloin was only 1 and a half pounds, so a pot roast would be larger (or not), you just adjust the cooking time to suit. 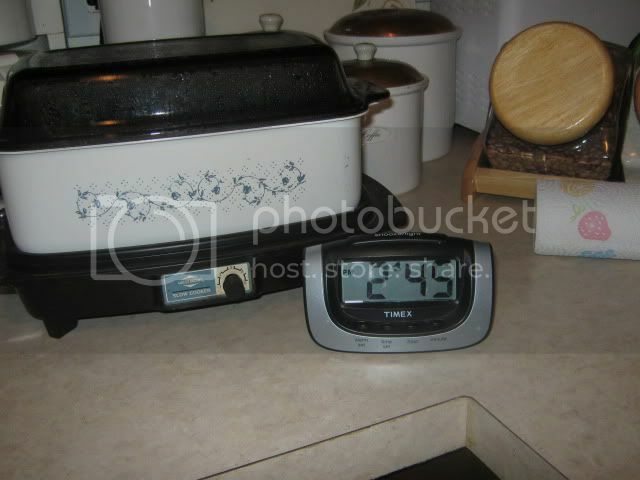 If your crock has more than one heat setting you can adjust that as well. do you see the little "circles" of grease???? My roast is 2 1/2 pounds. How long do I cook that for frozen?? Are you cooking it tomorrow? I would leave it in the fridge overnight, or even on the counter, if your house doesn't get uncomfortably warm during the night. Well, actually the fridge is safer. 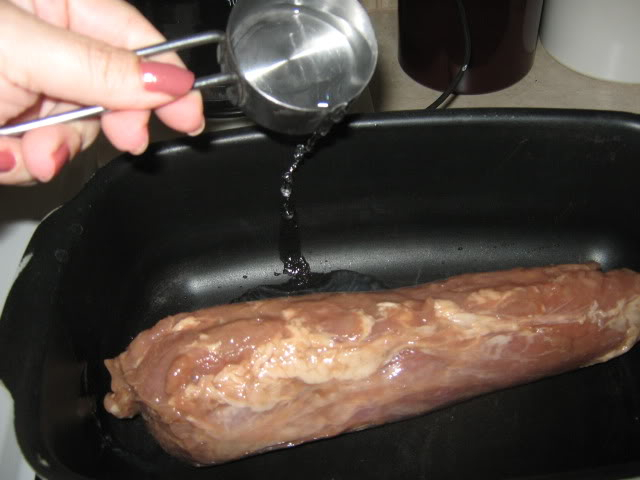 Tomorrow about 12:30 or so, unwrap it, cut off all the visible fat you see, then stick it in the pot with about 1/4 cup water. 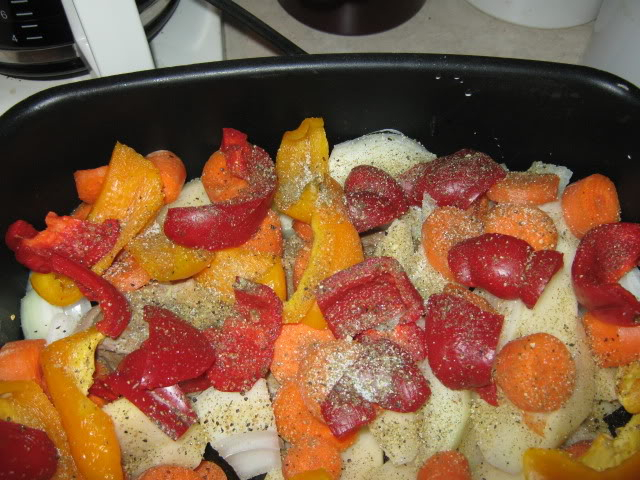 Season it, not too much salt until you are almost done cooking because the crock pot's type heat will dry out the meat if you use too much salt. But I like to put garlic and such on it when it first starts cooking. After about 2 and a half hours or even three hours, stick your potatoes and such in the pot. At that time you should be able to tell how close it is to being done. if it appears cooked through, then the last hour to two hours are what tenderizes it. And I mean it will just fall apart when you take a fork to it! Does your pot have more than just one setting? If so start it out at medium high or medium. - i just throw everything in the pot - frozen or not, close it up turn it on high and come back in 6 hrs - if i am going to be gone all day, medium for about 10 hrs. also, did you know you can make pasta in there? put your sauce in throw in the dried pasta, put it on medium and walk away for 6-8 hrs. i tried this and was sooooo excited - it worked! The crock pot I showed in the instructions has five different temp settings, you can actually biol water on the highest setting. So if yours has the temp settings like that, make sure its on medium!! But yeah, like she says,....throw it in walk away and when your timer goes ding...its done!!! That is what I like so much about it. it is virtually idiot proof!!! Mine has a warm, medium and high setting - the warm is only for keeping things warm after it has been cooked. when i was working, i used the crock pot all the time. i still use it when i am going to be working in the yard all day and the last thing i want is to cook or wait for something to be cooked. 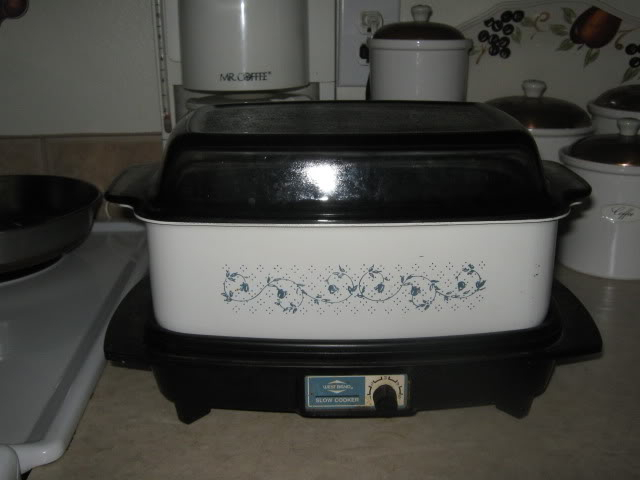 Mine also has a glass lid and i can roast a chicken or those really cute little chickens (cornish game hens) and it actually browns the little buggers. Like I said in another thread, if I had to choose only between my crock pot, my oven or my microwave, I would choose the crock pot!!! Mine only has low and high. Im going to make it on Saturday. So Should I wait to take it out of the freezer until tomorrow, or is it okay to do it now? If it thaws that long in the fridge, will it make a mess? I should probably put so paper towels under it. Im one of those people that thaws it in water in the sink a few hours before I cook it, thats why I ask. I was watching Emeril a few years ago, and he said that he likes to cut little pockets in his and slide cloves of garlic inside. I usually do that when I bake it in the oven. 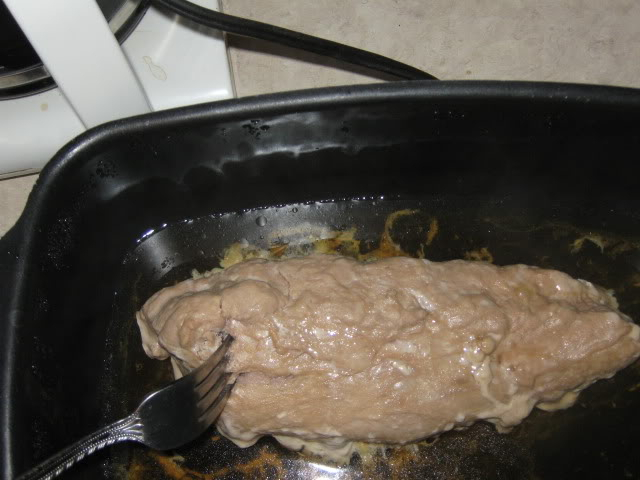 Do you think it would still taste awesome in the crock pot that way?? just put it on a plate in the frig so no mess. i dont know about the cloves but im sure it would! yes, i like doing the trick with the cloves of garlic, very very tasty! Wow...thank you Deedee...I have never been too good with recipes but yours is great. Very easy to follow and I will be trying it soon!